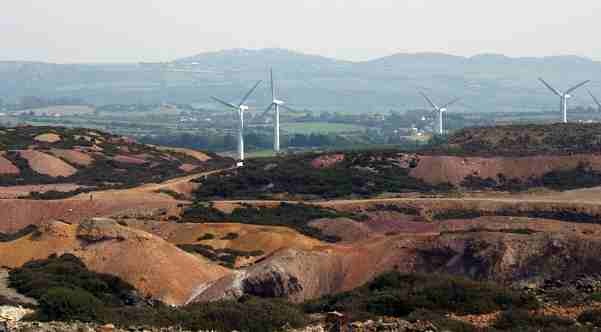 It's truly amazing to have the chance to visit a great location like the Anglesey Copper Mountain near Amlwch. Others call this spot Parys Mountain, but to me what's more important is to experience this unusual landscape with a long and rich industrial history. 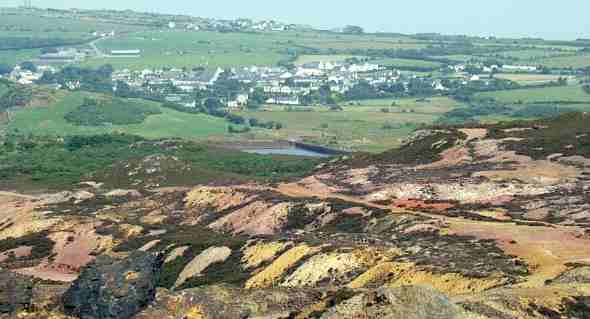 Our local Anglesey Copper Mountain goes back thousands of years and today you'll get a snapshot of why I find it a fascinating place to discover. 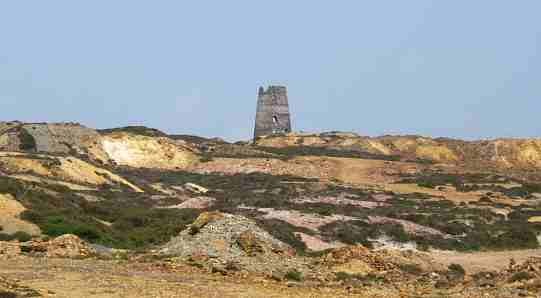 You can reach the history trail for Parys Mountain by leaving the town of Amlwch - also known as the Ancient Copper Town - going eastward along the A5025 and at the roundabout take the B5111 signposted for Llanerchymedd. The road will take you up a gradually rising hill and you will soon see the old copper mountain mineworks on your left. On the left you'll see a car park where the history trail starts and finishes. 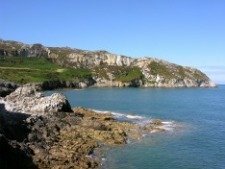 Here is a great spot for viewing the surrounding landscape, with Amlwch Port, strongly associated with Amlwch Copper Mountain, to the north. Across the road to the west, the present copper mountain mine works and operations can be seen. Anglesey Mining plc was set up in 1984 and has a full listing on the London Stock Exchange, with its feasability study here at Parys being one of its two projects. 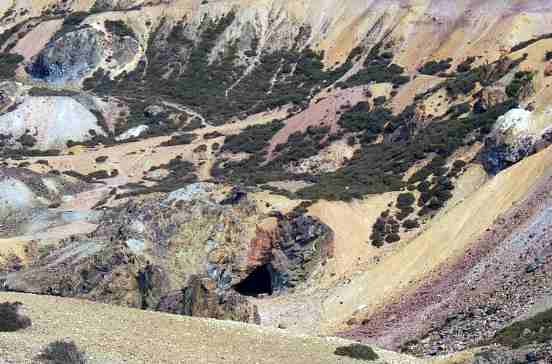 Among the 6 million tonnes of metal ores it has discovered during recent drilling operations are copper, zinc, lead, silver and gold; the largest sources in the UK. But that's it for the time being. You won't see blue chips like BHP Billiton, Rio Tinto or Anglo American making their way to this copper mountain just yet. 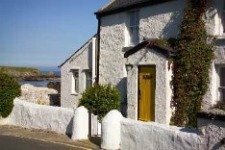 Of course, if Anglesey Mining does come up with some really interesting discovery which can be fully developed, then perhaps the big copper players will come knocking on the door. With China and other emerging economies growing apace, demand for commodities is at record levels and shows no signs of letting up. And this is how it was during the Industrial Revolution, when Parys Copper Mountain and Amlwch were synonymous with copper. 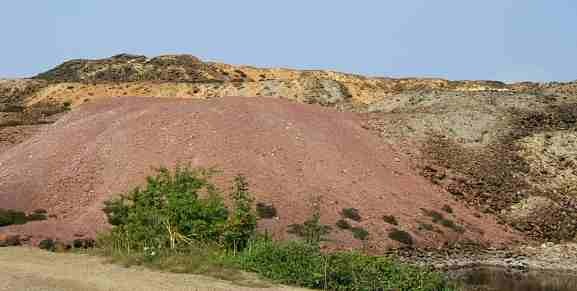 In fact, I'd say it is no exaggeration to consider copper ore from Parys Mountain dominated the world copper market. So influential was Amlwch and Anglesey copper that the British navy under Lord Nelson used the metal for sheathing its ships and for use in manufacturing cannons. So now we know the secret of Nelson's victory at Trafalgar. Anglesey Copper Mountain! The advantages of using copper for sheathing the ships was that it prevented, or at least slowed, the growth of seaweed and barnacles below the waterline. 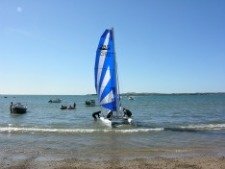 And as someone who has raced yachts, I know this can cut drag and improve manouevrability. 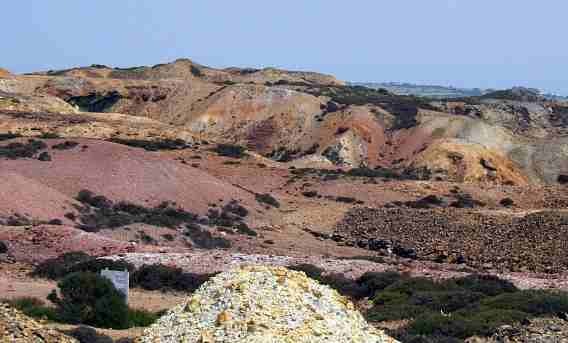 Walking up the slope from the car park I was immediately struck by the vivid range of colours in this rocky, almost moon-like, landscape. No wonder the BBC filmed some shots for Dr Who - the popular sci-fi series - here in the past. The immediate copper mountain environment is truly that dramatic and arresting to the senses. As I walked towards the now derelict Pearl Engine House, all about me was a mix of shades of ochre - yellow, brown and red. There were brown shades of buff, auburn, rust and copper. I'm sure artisitc experts in this field could find far more colour variations than me. Historians and archaeologists have worked together to give us a wealth of knowledge about the Anglesey Copper mountain. It seems as far back as 4,000 years ago, during the Bronze Age, local people had discovered traces of copper here. Copper ingots have been found here as well as in other parts of Anglesey, and the Roman occupation of the island up to the 4th century led to efforts at extracting copper ore. Walking among the ochre shades of rock you find plenty of wild plants that thrive in this "soil". Bordering stagnant purple coloured drainage ponds you'll find thriving "colonies" of bracken, wild garlic, yellow gorse, heather and brambles. The real surge in mining production and export occured during the Industrial Revolution in the 18th century. Apparently, in March 1768 the records show that a local miner, Roland Puw, was rewarded for playing a big role in discovering a big copper ore deposit near the surface of Parys mountain. He was given a rent-free house for life and a bottle of brandy for his efforts! 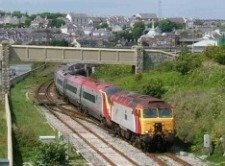 Records show that Thomas Williams, an Anglesey businessman and lawyer, lead the development of Anglesey Copper Mountain and turned Amlwch into a leader in world copper markets. Perhaps, today Williams would be the CEO of an emerging mining company on the verge of a big discovery! For his efforts, Williams was given the title of "Copper King". What would today's mining CEO's give for such an appellation? It's only when you walk along and down the various paths on the history trail that you get a real sense of the massiveness of the mine works here. And what's more amazing is the knowledge that much of the work was done by people using their bare hands. A massive hole or chasm in the ground was created by a combination of gun powder and workers using picks and shovels. When the ore was extracted it was broken into smaller pieces by hand and sorted for quality. 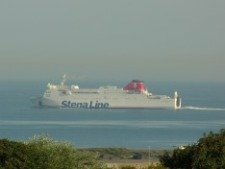 The best grade pieces were transported to Amlwch port from where they were shipped to Swansea in South Wales for smelting. The colourful drainage ponds I saw were used to recover copper and scrap iron by precipitation. 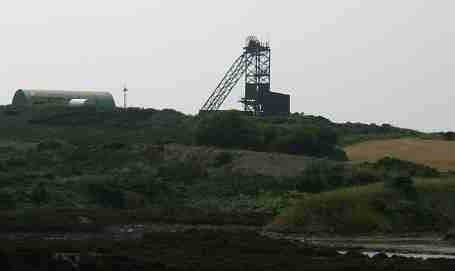 During my walk around the old works on Parys Copper Mountain I learnt how the mining industry spawned the growth of other industries in the Amlwch area. For example, some of the by-products of the extractive process such as alum, vitriol and ochre were used by chemical and other industries. Take ochre, for example, which is a variation of iron oxides and was used as a paint pigment to protect the sail canvas of fishing boats from seawater; remember the old song, "The red sails at Sunset". Another by-product was alum, or crystallised double sulpahtes of metal ions such as sodium, potassium, aluminium and iron, used as a dye-fixer in wool by clothing manufacturers. And vitriol which consists of various sulphate salts of copper, zinc, cobalt and iron was used in the chemical industry. Looking to the east from the Pearl Engine House you can see the village of Penysarn and beyond the blue sea off Point Lynas. Such variations in colours have a deep impact on the senses. While to the south you can see the large Llyn Alaw (Lake) with its wind farm on the ridge above Llanbabo. Even closer is the Trysglwyn wind farm, the blades breaking up the southern horizon and making a slight whirring sound which you can hear occassionally as the wind changes direction. Here the vestige of an old extractive industry shares the landscape with the renewable ennergy source for tomorrow. It is well worth making a visit to Parys Copper Mountain where you can experience the gentle variation in ochre shades and imagine what it was like to dig up copper ore in the 18th century. 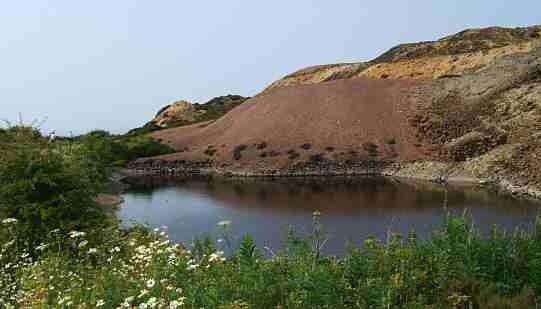 While across the Amlwch to Llanerchymedd road Anglesey Mining continues its testing which may signal a second major copper revolution. This time, however, the potential copper discoveries will not be for sheathing naval ships but for the vast expansion in 21st century global telecommunications infrastructure. Could Lundin Acquire Island Zinc Lead Mine?